Has been living and working in Auroville, South India since 2004. Was born in Russia to a ceramic family. 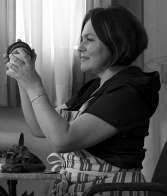 Began to work with clay at the age of 12 and has been in love with it ever since. Graduated from Pedagogical University as a Russian language and Literature teacher. Set up her first solo exhibition at 19 years. First official job was a TV journalist. But once moved to India in 2004, became fully dedicated to ceramics. From 2008 has been one of the two founders and a teacher at the ‘White Peacock’ clay club (working with students aged 4 to 17 years). The art pieces are kept in various private collections. 2008 – Duo show with Anna Morozova ‘Pottery Poetry’ at the Tibetan Pavilion in Auroville, India. 2008 – ‘The Mad Hatter’s Tea Party’, a group show at the Institute of Contemporary Indian Art in Mumbai, India. 2009 – ‘T-Adda’, a group show at Prakrit Gallery in Chennai, India. 2010 – ‘The other way of Tea’, a group show in Auroville, India. 2012 – ‘The storm within and out’, a group show in Pondicherry, India. 2015 – ‘Object: Spoon’, a group show at Beaver Gallery, Canberra, coincide with the Australian Ceramic Triennial.